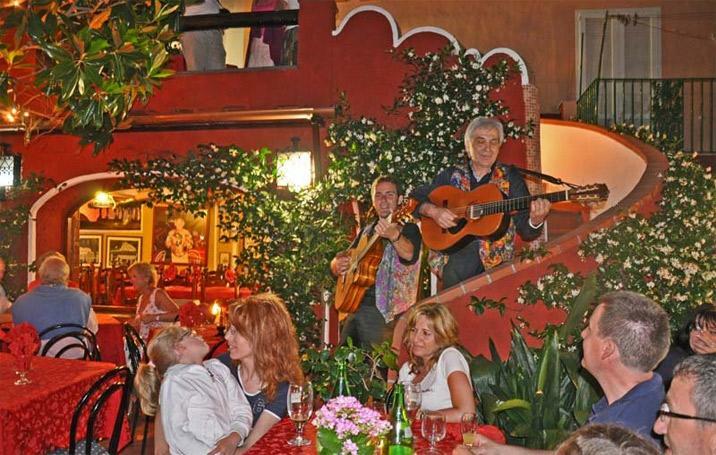 High level Taverna Ristorante Pizzeria with guitars, Italian singers, fine wines and typical international cuisine. The Giardino degli Aranci is an ancient typical tavern where many VIP stopped off in Ischia. The wonderful natural setting, with luxuriant plants, the typical architecture of palaces around the garden, the known kind Don Andrea Impagliazzo, the flavours of the best gastronomy and the rich vineyards make this tavern an excellent tourist stop. Andrea Impagliazzo is a gentle man but astute at the same time, making so special this local thank to his administrative skills. It's appropriate to organize a music garden, folklore, pictorial art (like the many paintings inside the restaurant show) and a refined cuisine. The local is situated in the historic centre in Ischia, along the famous shopping street, promenade reachable by bus, the bus stop is 300m and three minutes on foot. To who move by car, it's possible to let the car in one of the parking areas, from there a peasant walk links the restaurant.